Want a life size stand up of someone? 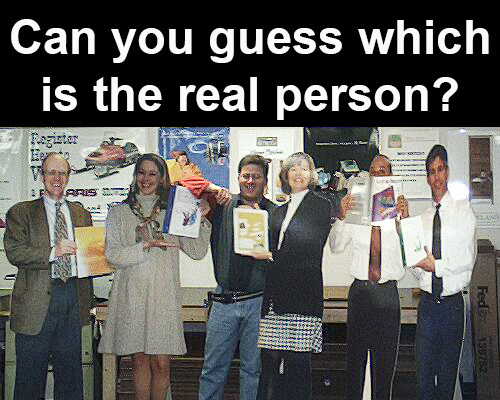 Send us a digital file of your person, and we'll print a cut out in life size on 3/16" gatorboard. We put a triangle stand on the back so it will stand by itself. We see life size stand ups used in tradeshow booths, at events and conferences, store front displays, and we've even done them for the lobby of a Broadway show! Cutouts are lots of fun. Photos for life size cut outs should be 72-100 dpi in their final size. We can usually do fine with a 6 megapixel (2000x3000 pixels) digital camera image, and that's if the person fills the photo. More pixels are always better! 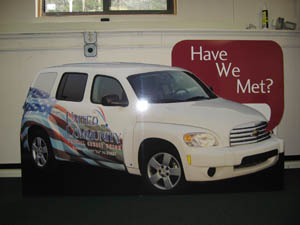 Typical size is 34"x72". Remember, we need to think about the structural strength and stability of life size stand ups, so it's a good idea not to have arms sticking straight out, people standing on one foot, etc. We ship these folded in two, with tape on the back serving as a hinge. The stand on the back is attached with VELCRO® Brand fasteners to the two halves, keeping them upright and straight. 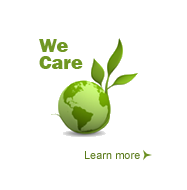 Browse and select the file you want us to print, complete the online ordering. $209 for a single cutout, 34x72" max. Call us for quantity pricing and for larger or smaller sizes. That includes your photo direct printed on white gatorboard with an easel back. Shipping FedEx three day service will cost $40-50 depending on your location. For large projects, please call. These three guys are typical stand ups. We've done cardboard cutouts of cars too! 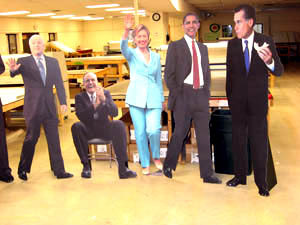 The New Hampshire Primary gave us life size cut outs of politicians! We made an extra of Obama and he lurked around our shop for a few years. 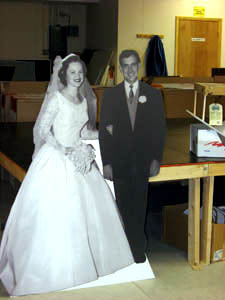 The family of this couple made a life size stand up of their wedding photo for their 50th anniversary! * The guy in the middle with the toolbelt is Ken from our finishing department.